According to a study by Experian, Apple iPhone users in America spend an average of 1 hour and 15 minutes using their handset every day. This compares to the average 49 minutes spent daily on their phone by Android users in America. 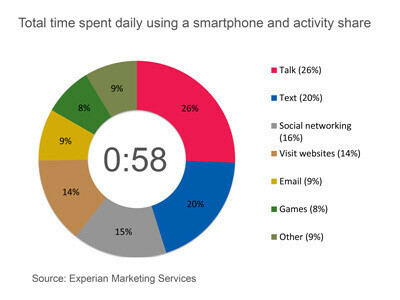 Overall, the typical American smartphone owner uses his or her smartphone for 58 minutes on average, each day. 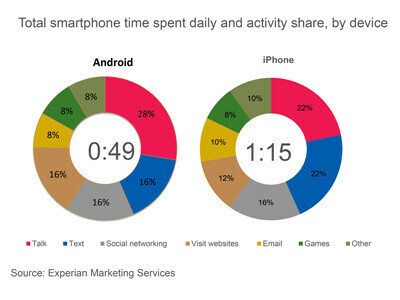 Even though American Android users spend less time on their phone than iPhone users, they are a chatty bunch. 28% of each day's smartphone sessions are devoted to talking if you're sporting a phone running on Google's open source OS. Apple iPhone users spend 22% of their phone time talking on the phone. And despite mobile Safari being considered the best smartphone browser by many, the typical American iPhone user spends 12% of his phone time on the internet compared to 16% for Android users. One thing that Apple iPhone users do much more often than their Android using counterparts, is text. 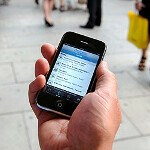 22% of the time spent using an iPhone by an American is to get those thumbs working over a hot text message. For those using Android, that figure is 16%. Can the difference be explained by the highly thought of virtual QWERTY on iOS, or is there something else at play here? As for Americans all together, of the nearly 1 hour spent daily with their smartphone, 26% consists of phone calls and 20% of sending and receiving text messages. Using a social network makes up 16% of the hour while browsing is at 14%. To round out the top 6, we have checking or writing email and playing games (9% and 8% respectively). Crappy OS + iphone users = longer time to navigate. How long does it take to turn something like wifi off on android? A few second, just pull down the menu and hit the toggle. On an iphone you have to go search for the settings app that you tucked away in a folder then find the wifi toggle in the settings then go back to what you were doing. Actually, my personal opinion is because of games. Every 8 out of 10 iOS users (be it the iPhone or iPad), i tend to see them being glued to a game. I can understand how some games can be addictive, but many of them just go overboard with the amount of time spent on smartphone games. yea people on a crappy iphone have to wait for their slow processors and limited amount of ram to do anything, meanwhile android users can quickly navigate to the app they want and send a text in half the time as an iphone user with swype (or something just as quick). Yeah...no. That's not going to translate to an extra 26 minutes of usage per day. And if people do need to switch wifi on and off frequently, why would they hide the settings app in the first place? Yeah... not really. The Wi-Fi is actually the second thing on the settings list. It's not a big time waster as you think. Funny because I can type it... "Apple sheep" Maybe you just can't spell? Highly thought of QWERTY keyboard? SWIFTKEY comes to mind, i don't have to toggle back and forth to find numbers or symbols. Ahh ... they just love to stare at their iconic phones. I love the majority of iphone users that just text, use facebook and play angry birds all day. The same thing a phone that you can get for $100 off contract can do better. And how is that different than using an Android phone? So that means iPhone users waste too much productive time just navigating back and forth? Approx 30 min/day loss of productive time could be a huge national loss. Did anyone compute the loss Apple is causing to nation (besides not paying taxes of course by stashing the funds abroad)? Very very rough estimate: Esimated they have sold about 55.75 million iphone 5's. So that means about 132.4986470482 years used a day if every one was used. If the same amount of android phones were used then its only 86.56578273815 years a day so iphones was 46 more years a day on average than android. Android user busy with Rom's, root, bencmhark and over clocking there phones unless if you own the Nexus. Iphone user busy with facebook, apps and camera. Only like 1% of android users even know what rooting their phone is outside of the phrase "jailbreaking your android." U know too tell u the truth I almost bought the first original iPhone when they launch the high price at 349 1st gen. Just glad I made the right choice waiting and bought Android. And after all the glitches they had so I was happy I didn't wast my money on iPhone. Actually those users are still clueless about how the is**t works? Actually the user asks siri where's the pub. And it shows the result as church? So you know now how people spend time with iPhone. You asked to the wrong thing. I asked to S-Voice, Google Voice and Bing, all of them said darkkjedii is crap. Be original or be silent. Oh, and you forgot the word "do" Einstein. And what fanboy are you? FAIL!! !